If anything is of interest to you or you just want to browse, click the listing and you'll be taken to one of my retail partners to find out more and complete your purchase. Easy. My Redbubble store can be accessed via it’s own link in the main menu. There are 3 different stores below. Fabric, gift wrap and wallpaper. Custom fabric printing with water based inks and no minimum order limits. • Fabric with many different types on offer. • Wallpaper, peel and stick or water activated. • Wrapping paper available by the roll. Beehive Tea towel; fabric available at Spoonflower. One fat quarter would be needed and the recommended fabric is: Linen cotton canvas. If you would like one that is already trimmed and stitched; these are available from my Roostery store. • Kitchen and Dining - Tea towels, tablecloths, runners, napkins and placemats. This may be a better option for residents from the United States and Europe with postage in mind. Society 6 offer many similar products as Redbubble does but they also have duffle bags, backpacks, trays and coasters. Watercolour Boho Feathers design available as a scarf from my Redbubble store. 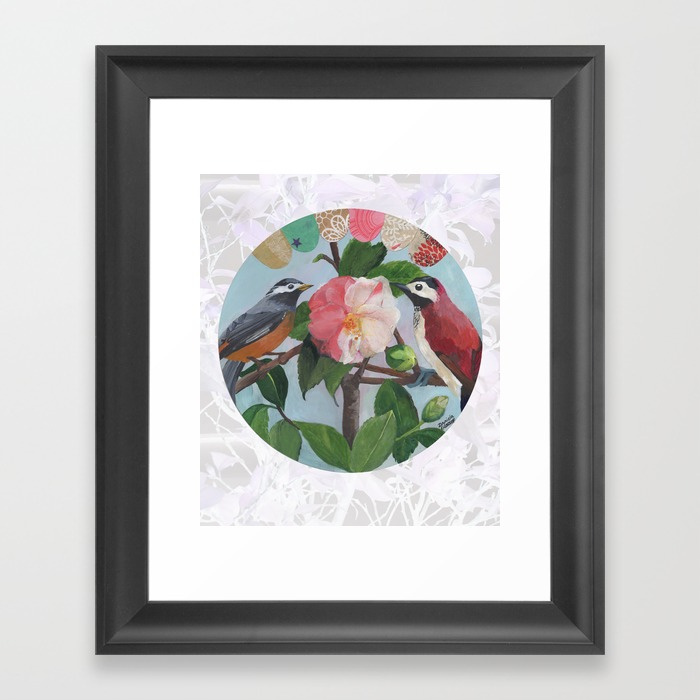 Love Birds framed print ©Daniela Glassop available from Redbubble and Society 6.